In 1984, and after years of negotiations, the Conne River Mi'kmaq became Newfoundland and Labrador's first Aboriginal people to register under the federal Indian Act, giving them access to the full range of programs and services available under the Act. Conne River (also known as Miawpukek) became a status Indian Reserve three years later, with an on-reserve population of about 800 and an off-reserve population of about 1,700. In addition, the Conne River Mi'kmaq have filed various land claims with the federal government, although Ottawa has not yet accepted anything for formal negotiations. While the Miawpukek Mi'kamawey Mawi'omi governs the Conne River Mi'kmaq, other organizations came into existence since the 1970s to represent other Mi'kmaq across the island; these include the Federation of Newfoundland Indians (FNI) and the Ktaqamkuk Mi'kmaq Alliance. Mi'kmaq members of FNI voted in 2008 to accept an agreement in principle with the federal government to form a landless band under the Indian Act, which, if finalized, will provide them with funding for health, education, and economic development. Like other Aboriginal organizations in Newfoundland and Labrador, Mi'kmaq groups are vital to the preservation and promotion of Native lands, resources, institutions, culture, and practices. However, the province's Indigenous peoples have only become formally organized in recent decades, often in response to increasingly intrusive outside activities that threaten their land and cultural traditions. Instead of immediately colonizing Newfoundland and Labrador, the British Empire used it primarily as a seasonal fishing station until well into the 18th century. Large-scale European settlement did not occur until the mid-1700s and it was not until the early 19th century that government, religious, and other institutions became well-established on the island. Labrador and remote portions of Newfoundland – which included Mi'kmaq lands – were often beyond the range of government influence until the early 20th century, although religious groups, merchants, and fur traders had considerable influence in these areas. Contact between the Mi'kmaq and the Newfoundland and Labrador government was rare until the late 19th and early 20th centuries. Artist unknown. Courtesy of Library and Archives Canada (C-116272). 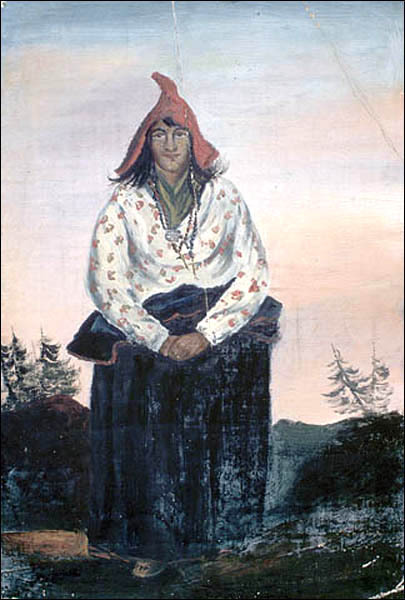 As a result, contact between the Mi'kmaq people and the Newfoundland and Labrador government was rare until the late 19th and early 20th centuries. The lack of well-defined British settlement plans resulted in an absence of land treaties between Aboriginal and European peoples, although Newfoundland and Labrador Governor Sir William MacGregor granted land to the Mi'kmaq at Bay St. George, Conne River, and possibly in the Codroy Valley area during the early 1900s. A fur trade also existed between the Mi'kmaq and British or French settlers, although it did not progress to the extent that government officials felt it necessary to create any special legislation. When Newfoundland and Labrador joined Confederation in 1949, the Terms of Union between the two governments made no reference to Aboriginal peoples and no provisions were made to safeguard their land or culture. No bands or reserves existed in the new province and its Native peoples did not become registered under the federal Indian Act. This made their land, resources, and culture vulnerable to outside forces over which they had little to no control. Under the Smallwood government, for example, the Bay d'Espoir hydroelectric project flooded Mi'kmaq hunting grounds and destroyed caribou habitat. At the same time, the government introduced a universal school curriculum that helped alienate Mi'kmaq students from their heritage and language. Teachers delivered lessons in English and textbooks incorrectly blamed the Mi'kmaq people for killing off the Beothuk. The Mi'kmaq became part of a nationwide movement by Aboriginal peoples in the 1970s to reclaim their rights as First Nations. This was partly in response to a 1969 federal government document, The Statement of the Government of Canada on Indian Policy (also known as the White Paper), which proposed getting rid of the Indian Act altogether. The proposal sparked much protest and dialogue among Aboriginal peoples, who believed the new policy would threaten their treaty, land, and other rights; as a result, the government withdrew the document in 1971. 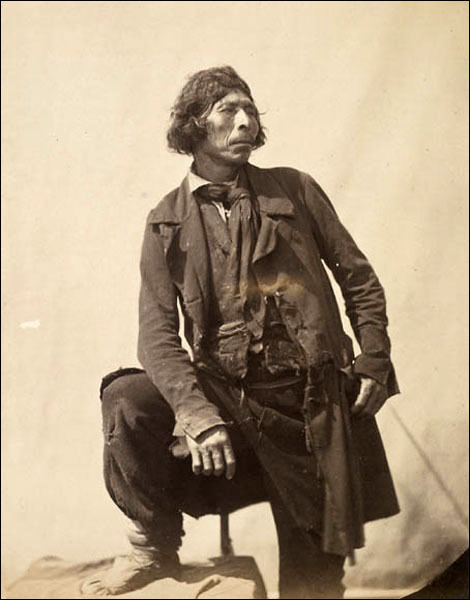 Aboriginal peoples in Newfoundland and Labrador, like elsewhere in Canada, hoped that by becoming organized they could better protect and promote their needs and rights on the public stage. In 1972, the Conne River Mi'kmaq elected a chief and band council; one year later, Mi'kmaq, Innu, Inuit, and Kablunângajuit people across the province formed an umbrella group known as the Native Association of Newfoundland and Labrador (NANL). By 1976, however, the Innu people broke away from NANL to form the Naskapi Montagnais Innu Association (today the Innu Nation), while the Inuit and Kablunângajuit left to form the Labrador Inuit Association. Newfoundland and Labrador Governor Sir William MacGregor granted land to the Mi'kmaq people at Bay St. George, Conne River, and possibly in the Codroy Valley area during the early 1900s. Photographer unknown. Courtesy of Library and Archives Canada (PA-195497). NANL changed its name to the Federation of Newfoundland Indians (FNI) and today represents about 10,500 non-status Mi'kmaq people in central and western Newfoundland. The FNI delivers government-funded services to its membership and is working to obtain official recognition for its members as status Mi'kmaq under the Indian Act. In 2008, FNI members voted in favour of a landless-band agreement with the federal government. If finalized, the agreement will grant official status to FNI Mi'kmaq people under the Indian Act, allowing them to form a new band as early as 2010. The agreement, however, does not allow for the creation of any reserves. After years of negotiations with the federal government, the Mi'kmaq at Conne River (or Miawpukek in Mi'kmaq) broke away from FNI in 1984 to become registered as a band under the Indian Act. Ottawa also recognized the community as an official reserve, known as the Samiajij Miawpukek Indian Reserve, in 1987. As a result, Miawpukek Mi'kmaq now have greater control over their land, resources, education, culture, and economic development. Before becoming a reserve, Miawpukek was a poor and struggling community with high unemployment; today, almost all of its residents have full or part-time employment and the community is one of the fastest growing in the province. A third Mi'kmaq organization, the Ktaqamkuk Mi'kmaq Alliance (KMA), came into existence in 2002 with a mandate to promote and develop the cultural, economic, social, and educational interests of its members. The KMA is opposed to FNI's attempts to form a landless band, and instead favours an agreement that would allow Mi'kmaq people to form a reserve. This, it argues, would create equality for all Mi'kmaq people with the Miawpukek Reserve at Conne River and make reserve residents eligible for federal programs and services. Aboriginal groups file land claims with the federal and provincial governments to acquire rights to lands and resources they used in the past and did not surrender to anyone else. The land claim is a formal document and negotiations are lengthy – often taking years or decades. Land claim applicants have to prove their ancestors belonged to an organized society that occupied a specific territory of land prior to European settlement and that neither they nor their descendents legally handed over that land to colonists or subsequent governments. Once settled, a land claim may grant a variety of benefits to applicants, including land title, fishing and trapping rights, and financial compensation. The Conne River Band Council filed a land claim on behalf of 1,400 Mi'kmaq in 1980 for land in southern and central Newfoundland. The federal and provincial governments both rejected the claim by 1986, in part because of uncertainties surrounding whether the Mi'kmaq people regularly used the island before European settlement. Ottawa, however, has provided Conne River with funding to perform more research and continue working towards a land claim. For other related articles view the Mi'kmaq section of the Aboriginal Peoples Table of Contents.